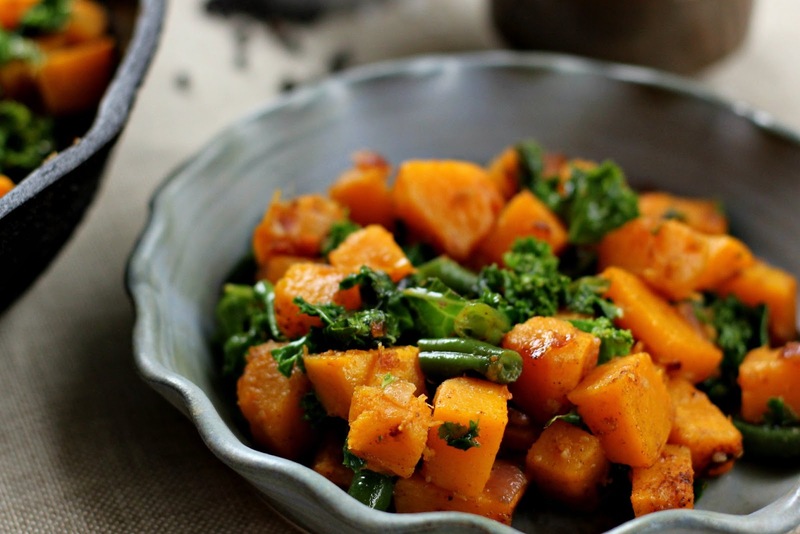 Gently spiced pumpkin paired with caramelised onion, green beans and a handful of kale thrown in at the end...this dish is a hearty, satisfying Autumn meal. It's quick to throw together and the additional ingredients are easy to chop and change to suit your pantry and personal taste. 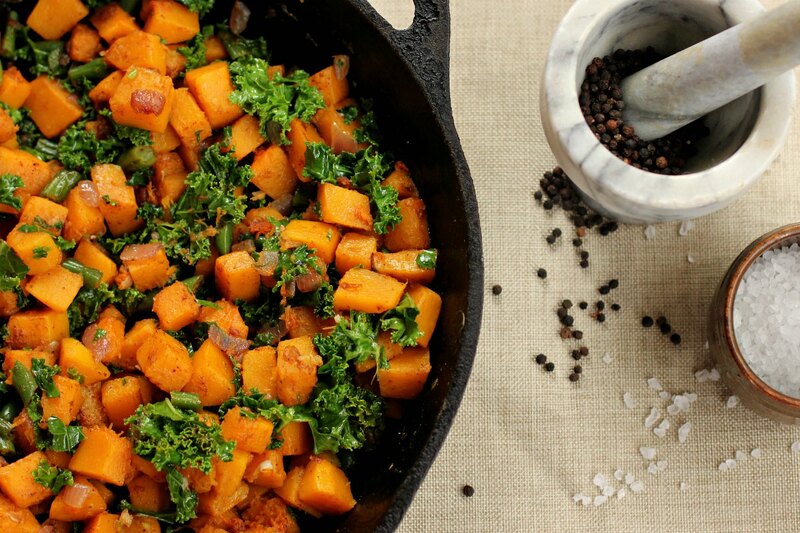 Turn up the heat with more ginger or leave it out altogether - it's completely up to you. Sometimes I add a tin of drained chickpeas, sometimes a cup of cooked rice. Try different ingredients and see what suits you. Make this midweek for an easy meal, on a lazy weekend for lunch or any time you need a little warmth and comfort in your day. 1. Heat a few tablespoons of olive oil in a fry pan over medium-high heat. Add the onion and pumpkin and cook for a minute or two. Add the garlic, grated ginger and green beans. Add more oil if necessary to prevent sticking, and cook until the onion and pumpkin has softened. Stir occasionally but not too often or you'll mush up the pumpkin. 2. 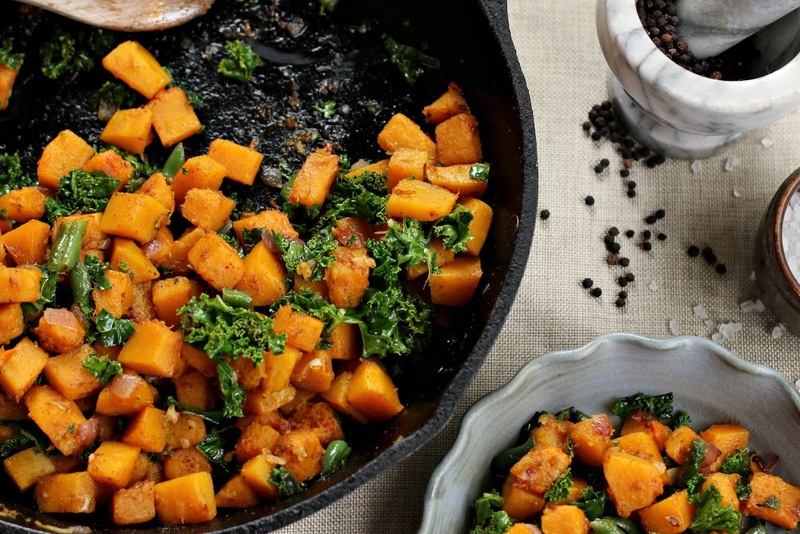 Add the butter to the pan and allow it to melt, coating the vegetables before adding the kale and spice mix. Pop a lid on in order to wilt the greens. 3. Remove from the heat, season with salt to taste and serve with a generous dollop of creme fraiche. That sounds delicious. We are heading into spring here but most of those veggies are still in season here. Moving in to spring here in the USA, but definitely bookmarking this one for autumn! Looks scrumptious.